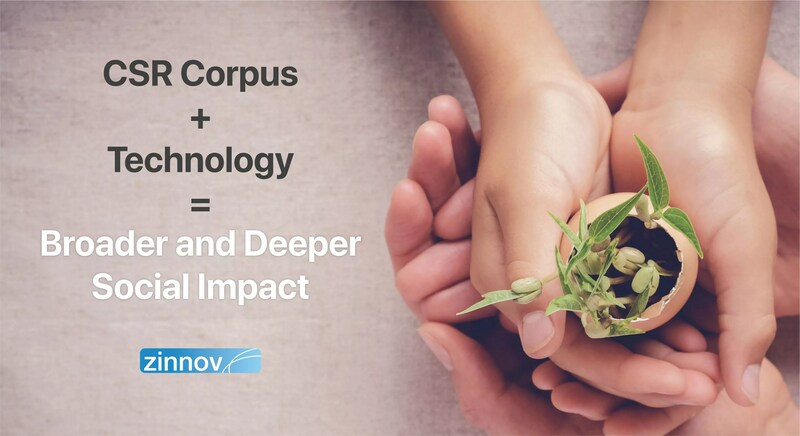 The Internet of Things (IoT) presents a massive opportunity to the technology ecosystem that could potentially transform the way we live and conduct business. 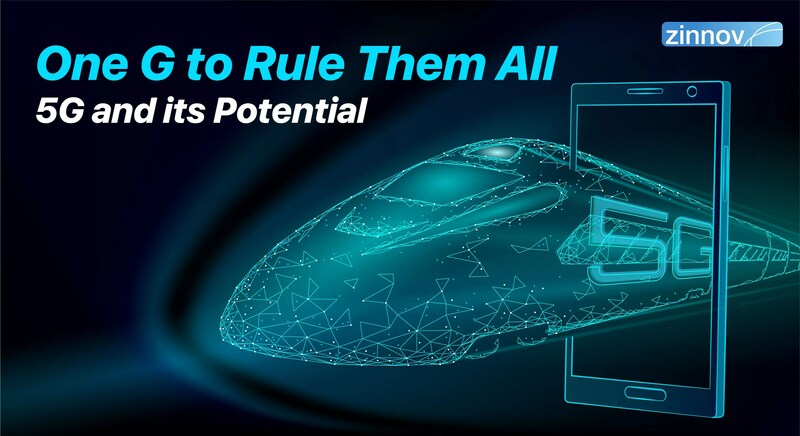 With IoT being such a big influencer in the digital transformation of the technology ecosystem as a whole, it pays to know who the biggest players, the highest spenders, and the niche Service Providers are with whom Enterprises can partner with to provide world-class solutions to customers. The IoT Technology & Services market presents a massive opportunity for Service Providers and Enterprises alike. 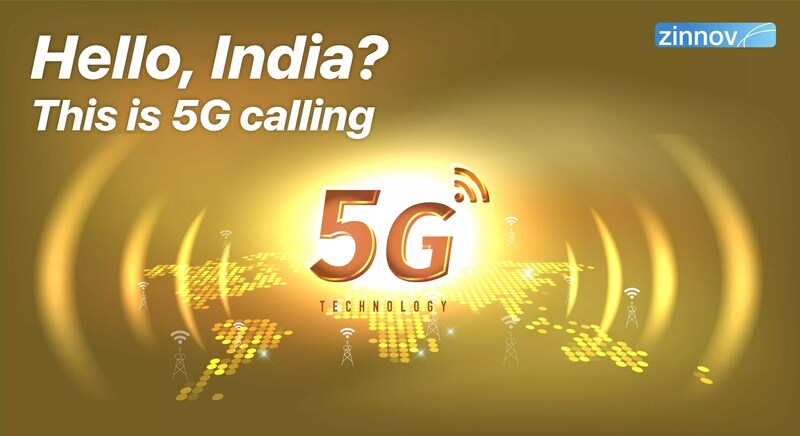 According to Zinnov Zones 2018 IoT Technology & Services report, the total IoT Technology & Services spend will more than double in the next five years, from USD 201Bn to USD 500Bn. This signifies a rapid growth of the IoT Technology & Services market at a CAGR of 20% by 2023. So what’s driving this massive IoT spend? The convergence of disruptive technologies and rapidly evolving business models is accelerating spend. The enterprise community is keen on exploring new uses cases to unlock value from IoT and enable new business models that generate alternative revenue streams. The increasing adoption of foundational infrastructure (edge, fog computing, LPWA, etc.) has reduced costs associated with compute, network, and storage. 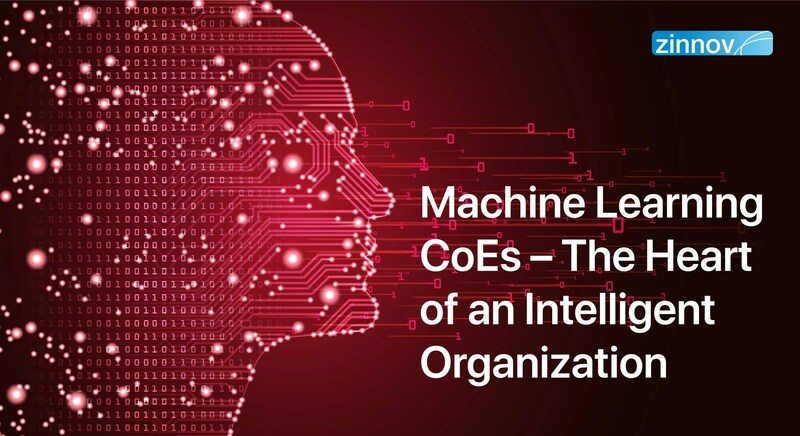 Maturing AI and ML technologies have enabled the management of exponential growth in data generated by devices/sensors to provide real-time insights for IoT-enabled decision-making. Of course, this roadmap is not without its challenges. It is no surprise that security and privacy remain among top concerns of Enterprises and Service Providers alike, given that we live in the post-Snowden and post-Wikileaks era. Further, lack of interoperability locks potential value from IoT systems. Enterprises are mature when it comes to adoption of IoT for operations excellence. Further, customer experience has successfully leveraged IoT to enable new products/services. 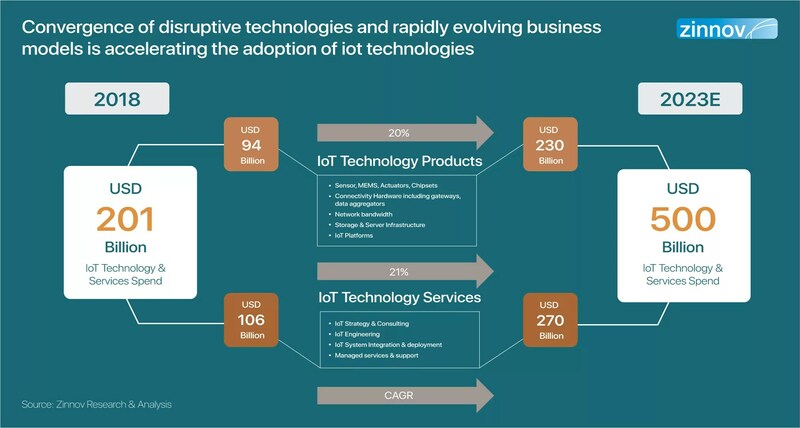 Owing to unclear visibility on RoI, coupled with the level of complexities involved in transforming existing business models, IoT adoption to enable new revenue streams is not as mature yet. In fact, ~60% of IoT initiatives get stalled after the PoC stage. Enterprises need to take an agile and iterative approach while focusing on demonstrating value at each stage to internal and external stakeholders in order to cross this IoT chasm. Organization Structures: Enterprises are creating unified data organizations to centralize talent and enable innovation. IoT is driving Enterprises to enhance coordination across different silos such as product design, cloud operations, service improvement, and CX. People Skills: Enterprise hiring is focused around platform engineering, UI, UX, and data science capabilities. In addition to hiring for specific skillsets, Enterprises are creating leadership roles to design and oversee the IoT adoption roadmap. Open Innovation Fabric: Enterprises are adopting an open innovation fabric permeating beyond the walls of the organization to include Service Providers, peers, start-ups, and universities to drive innovation. Adoption of Transformative Business Models: Enterprises are adopting different business models viz. 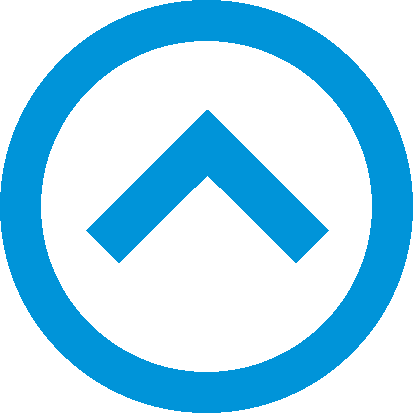 As-a-Service, Data Monetization, and Platformization, based on multiple parameters such as vertical play, customer engagement, and maturity. Service Providers are playing a key role in the IoT ecosystem and hand-holding Enterprises for multiple IoT-based transformative initiatives. 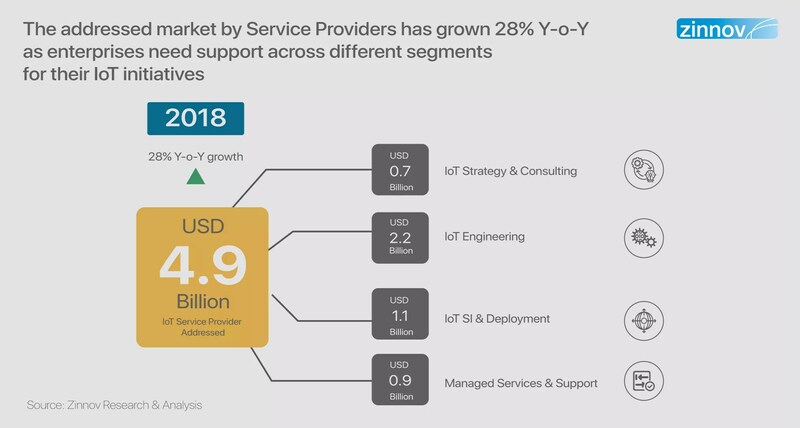 The Zinnov Zones IoT study analyzed the existing business of IoT Service Providers, where the addressed market share currently stands at USD 4.9Bn. This shows a marked growth of 28% in the last one year. Further, the IoT services marketplace is highly consolidated with the Top 25 Service Providers accounting for more than three-fourths of the market. Service Providers with end-to-end capabilities help enterprises manage the challenge of multiple vendors, which is one of the biggest pain points for Enterprises. Service Providers with end-to-end capabilities across the IoT stack with the ability to stitch together IoT solutions and services from a multi-vendor environment have emerged on top. The fact that the market addressed by Service Providers is growing at a faster rate than IoT spend indicates that Enterprises need significant “hand-holding” for their IoT initiatives. Of the outsourced IoT services market, engineering services account for the lion’s share. However, managed services & support will witness strong growth as Enterprises look to SPs for IoT infrastructure enablement and data science capabilities. Partnering with the ecosystem: Partnering with multiple players across the ecosystem (tech companies, hardware companies, start-ups, etc.) to build end-to-end stack capabilities. As Enterprises continue to explore newer use cases through IoT, adoption will continue to be on the rise. The Service Provider community is building capabilities to help Enterprises cross the chasm. In our next part of this series, we will highlight the adoption trends for specific use cases in Enterprises. Stay tuned. 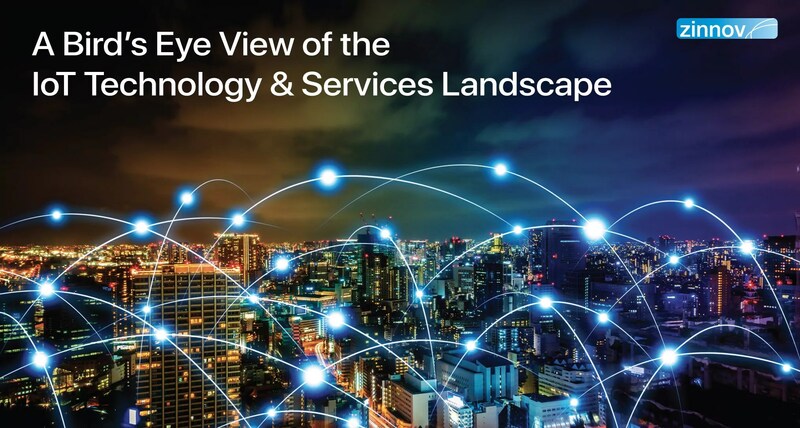 The latest Zinnov Zones IoT Technology and Services rating provides a bird's eye view of the IoT market landscape and the opportunities therein for Service Providers.